G is 4km east of A. 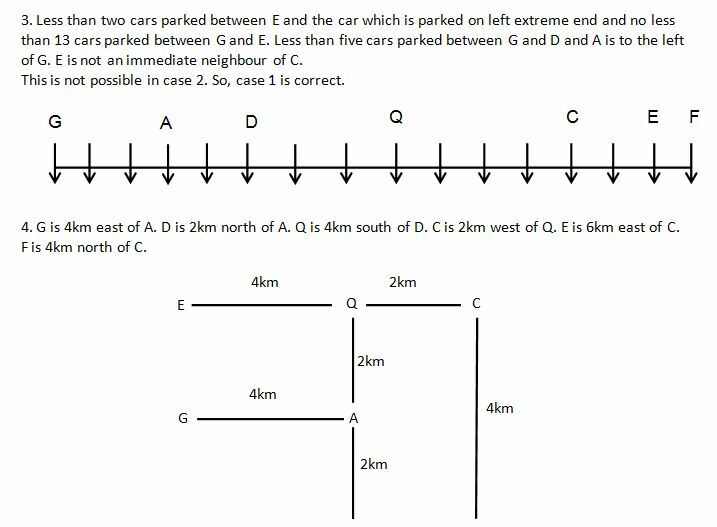 D is 2km north of A. Q is 4km south of D. C is 2km west of Q. E is 6m east of C. F is 4km north of C.
Who among the following parked on extreme left end? What is the direction of car E with respect to car F? 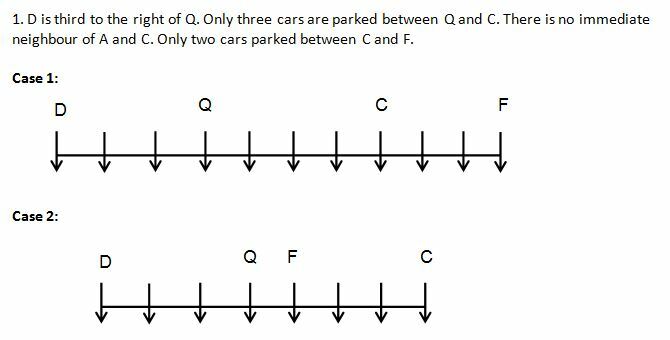 How many cars are parked in the line? Which of the following cars are immediate neighbours of each other? 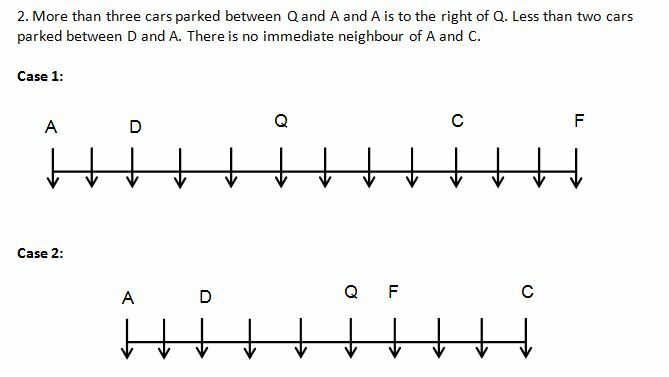 What is the direction of car G with respect to car C? Eight persons A, B, C, D, E, F, G and H lives on ten floors building starting from ground floor number one to top floor number ten. There were two vacant floors in the building. There are eight games Hockey, Basketball, Cricket, Polo, Football, Volleyball, Golf and Table Tennis in which only one person likes one game, but not necessarily in the same order. The one who likes Table Tennis lives below the one who likes Polo but does not lives below the one who likes Golf. There are three floors between A and B. The person who likes basketball lives below to both A and B. 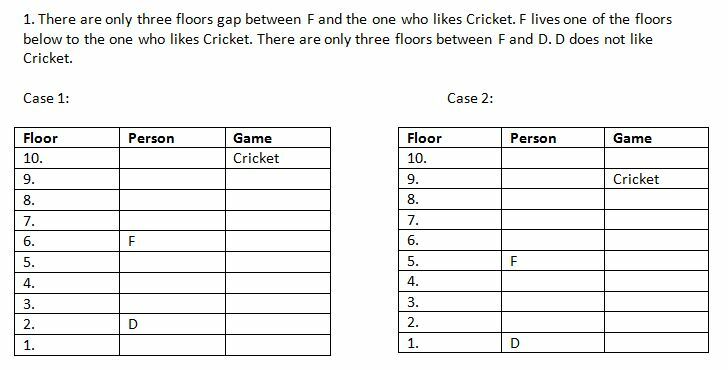 There are only three floors gap between F and the one who likes Cricket. F lives one of the floors below to the one who likes Cricket. There are only three floors between F and D. G lives immediately below the one who likes Volleyball. The number of person lives between F and the one who likes Cricket is same as the number of floors between F and the person who likes Football. D does not like Cricket. The one who likes Volleyball does not lives on the topmost floor. 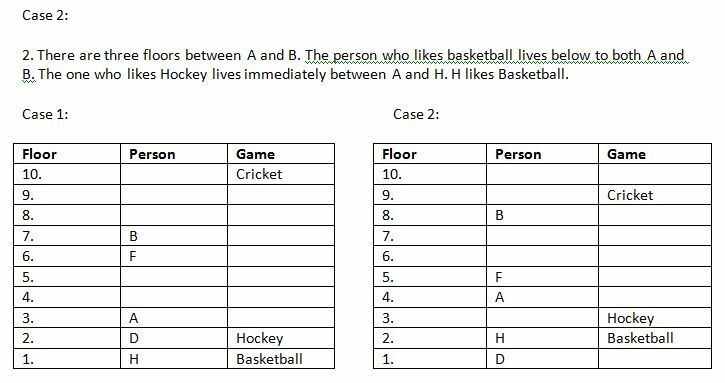 There are two floors between H and C. The one who likes Hockey lives immediately between A and H. H likes Basketball. Who among the following likes Polo? Who among the following lives immediately below the vacant floor? Directions: Study the information given and answer below question. 8. There are 5 boxes B, D, F, H, and J of candies stored in 5 floor shelves one above the others. In which floor does box F store? (I) Box H is at topmost floor. Box D is just below B but store in even numbered floor. (II) Box H does not store in an even number floor. 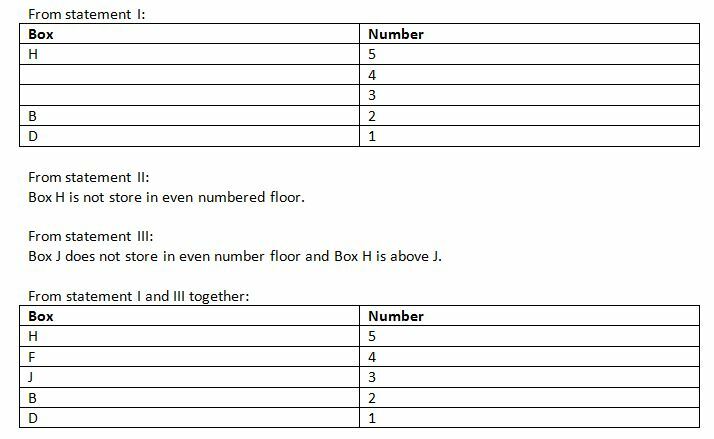 (III) Box J does not store in even number floor and H is above J. Answer – 3) If the data in statement I and III together are sufficient to answer the question, while the data in statement II is not sufficient to answer the question. The centre has released an additional Rs.65 crores to the state to implement the mid-day meal scheme in primary and upper primary schools in educationally backward areas for the current academic year. Which of the following is an assumption implicit in the given statement? I) Midday meal scheme is not implemented in high schools. II) Midday meal encourages children to go to school. III) More than Rs.65 crores has been spent on mid day meal in educationally backward areas for the current academic year. The statement does not refer to high schools. Moreover it is stated that the released funds are additional funds. It is not known how the earlier funds were released. Hence, I is out of extent. As the released funds are for schools in educationally backward areas, it is clear that government is under the assumption that midday meal scheme would encourage children to go to school. Hence, II is an assumption. It is stated that the funds have been released but not that they have been spent. Hence, III is out of context. Statement: Many people are of the opinion that physical exercise should be made mandatory for employees to improve their efficiency at workplace. I. It is found that work environment is a better motivating factor than monetary benefits. II. Even for the most able sport persons, physical exercise is an essential part of practise session. III. Children who do physical exercise show better academic performance than the ones who do not. Statement I talks about the work environment but not about the physical exercise. Hence, I do not support the opinion. Statement II states that physical exercise is important, it does not state whether the physical exercise improves the performance or helps to maintain the performance levels. Statement III states that those who do physical exercise exhibit better performance rather than those who does not. Hence, III supports the opinion.